We designed and built this Billet Head in 2008 (1st year of the new CFI Liberty Engine but was not able to make more than 4HP over the 14:1 Polaris Stock Head's Design.. In 2009 to Present, Polaris lowered the compression ratio to 12.5:1 with a less effective design. So, since Polaris has went back to the old "No Power" Design chamber. 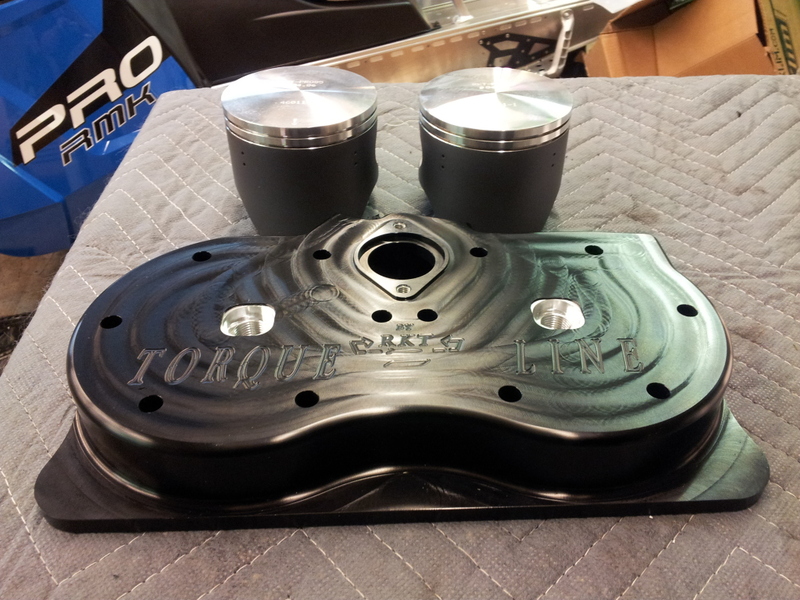 We have decided to re-release our Torque-Line Billet 800 CFI Head to the public. This head will gains some much need cooling and add about some serious on top end, as well as, mid range power increase..
We have some INDEPENDENT DYNO runs on a 2012 RMk ASSAULT comparing the STOCK Polaris head to the RK Tek Patented Head design. NOTE: These Dyno runs are comparing the SAME compression ratio.. These dyno runs show a SOLID 6-8HP INCREASE throughout the ENTIRE RPM range with a HUGE increase in Over-Rev... Again, this is comparing the SAME compression ratio. With the higher elevation, where one can run higher compression, the power increase will be MUCH greater. This head is especially beneficial when making a big bore engine or in a turbo application! RK Tek PIONEERED the first "Cheater Heads" WAAAAY back in 1999. We actually use your OEM stock head and machine it to accept our Billet Head Inserts. This way, the head is totally stock appearing, YET, has all the benefits of our Patented Combustion Chamber Design. So, you get RK Tek's Patented Combustion Chamber installed in your OEM Head Shell! What can be better than that? Now, the Dealer can "officially" inform Polaris that your engine has the STOCK head installed! Now, you can have the "#1 Bang for your $$" RKT Pro Drop In Kit OR the Monster Power 858 Big Bore Kit installed and NOBODY would be the wiser!! Here is a link showing this INDUSTRY FIRST Cheater Head!